Beyond the different ways to launch and promote a project by crowdfunding, which already represents an extensive subject, there remains an unavoidable question from the outset of the project: what are my networks and how can I have an effect on them? Crowdfunding is, no surprise here, a matter of trust. You must show that you are motivated by your project, and at the same time inspire confidence in your visitors in order to convince them to become your supporters. These three ‘circles’ can help you to reach your objective, and you must in turn conquer each of them. The first circle: family and friends. In 99% of cases, these are your first supporters. It’s only natural; the necessary trust has already been established between you for a long time. They help to start your project by providing it with its first funds. They set the first green signals, demonstrating that you are a genuine project owner capable of gathering people around your idea. They make you seem credible, and by being first to give their support, set the ball rolling for the funding process which you need to reach your objective. Don’t hesitate to discuss your project with them, make them participate in your blog, ask them to leave a comment and respond to it: these measures are also important as it’s the social dimension to your project. Respond to your public and make them participate. The second circle: friends of friends, other acquaintances. 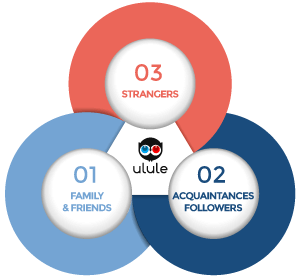 You barely know them; you’ve met briefly at a party, through friends or at work… these supporters enter into the circle once the initial signals of trust have been planted by your first circle: when there is already some money in your account, as well as discussions and encouragements on your project page or Facebook profile. They arrive after the help and “good luck” wishes of your closest friends. Don’t forget to respond to their questions, to thank them; in short, leave them with as warm an impression as you got in discovering their support. Who knows, you might acquire new friends during the adventure. Of course, you feel that the more your personal network is important and the closer you are to its members, the more it will benefit you. Most of the little and average projects can be financed exclusively from your first and second network circle. There is every chance that you already have the necessary support around you to embark upon crowdfunding with a first project at a reasonable budget. The most important projects require you to roll up your sleeves and capture the attention of the third circle: the most difficult of all. It is extremely difficult to predict the impact this third circle will have on your project. Do not count on it completely; you risk deception, especially if you don’t have a lot of original content to publicise. Try to appeal to them and produce content, content, content to share and share and share. Good luck! Producing that content is the part where I'm stuck. I have the big idea, but not the know how of social media. I think concept is 100% agreed by people. Such an awesome post.